Give Your XMB a Fresh New Look. Alongside the custom icons cuz those pkgs is NEEDED in the CFW for those with Webman! - Smoother Transition in XMB Wave changes. - Detailed RCO Mods for those who is looking for a specific MOD not the entire mod. - Added Two Altenative Gameboot Wave Colors (Separated Folder). - You telll me, maybe its the last release. ntodek, T.A.U, STLcardsWS and 5 others like this. T.A.U, joni solihin hamzah, Yugonibblit and 3 others like this. T.A.U, DeViL303, STLcardsWS and 1 other person like this. ntodek, T.A.U, DeViL303 and 2 others like this. @LuanTeles I made release/information thread here. Everytime when you want add new version, or edit something, just Tag me using @ and my nick. All links are basing on original mediafire links. kozarovv and STLcardsWS like this. - Improved XMB PSN icon quality for Higher Screen Resolutions. - Improved and Redesigned Notifications Background. - Improved and Redesigned Battery Level Background. - Improved and Redesigned Help Text Background. - Side Menu about Game Logo changed from Default PS3 Logo to PS3 PRO Logo. - Some Changes in PS3 PRO Theme. Can u do an update for cfw 4.82??? ntodek, T.A.U, LuanTeles and 1 other person like this. T.A.U, Yugonibblit, chronoss and 1 other person like this. - PS3 4K PRO 4K Remade. 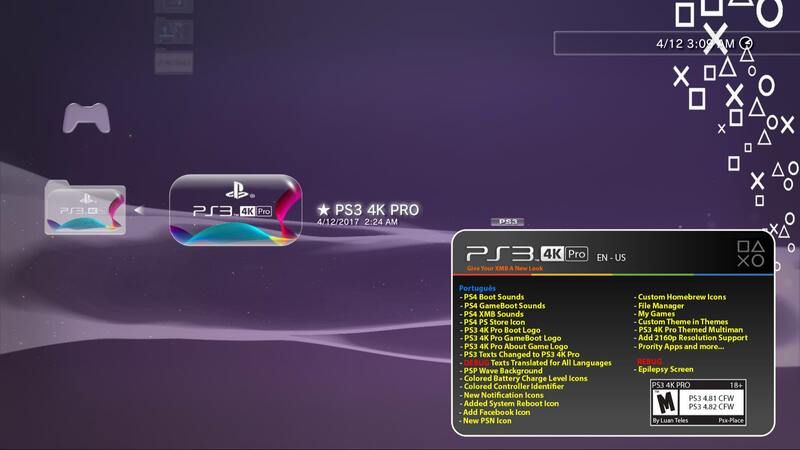 - Added XMB Texts PS3 4K PRO for the PS3 4K PRO Mod. - Added Reboot System Option (Translated for All Languages) under Users XMB Category. - Rebuild the Mod as a PKG. -Fixed PRO size in PS3 PRO/4K Coldboot and Gameboot. - Improved About Game Side Menu PS3 PRO/4K Logo. - Some Modifications in File Manager. - Themed Multiman PS3 PRO/ 4K. - Added Facebook Icon under Network Category. - Added Xai Plugin by Misys to make some custom functions to work. - Added Epilepsy Warning Screen back to Rebug (Optional and for OFW look). - Added Photo Gallery support in Debug mode. - New Battery Metter Icon for Bluetooth Devices. "Colored (Default) and White (Alt.)" - Added new colors for controller identifier. T.A.U, Johnnie, bigbossu and 5 others like this. New Version Will be Out Today! you're amazing, my friend. I never had the patience to make a full mod like this. I was mostly testing if mods even worked. RandomDude and LuanTeles like this. Links in my last post edited. pinky and chronoss like this.